Balthus is one of those painters who cannot be categorised. He intentionally isolated himself from all the artistic trends that succeeded one another, in order, as he once confessed, to achieve a timeless realism. His painting was not influenced by the widespread return to realism, as he had used the art and techniques of the Old Masters to represent his own particular universe from the outset. His apparently inoffensive, characteristic bourgeois interiors are the chosen settings for depicting an ambiguous world populated by young adolescents in the midst of puberty which adults dare not enter. 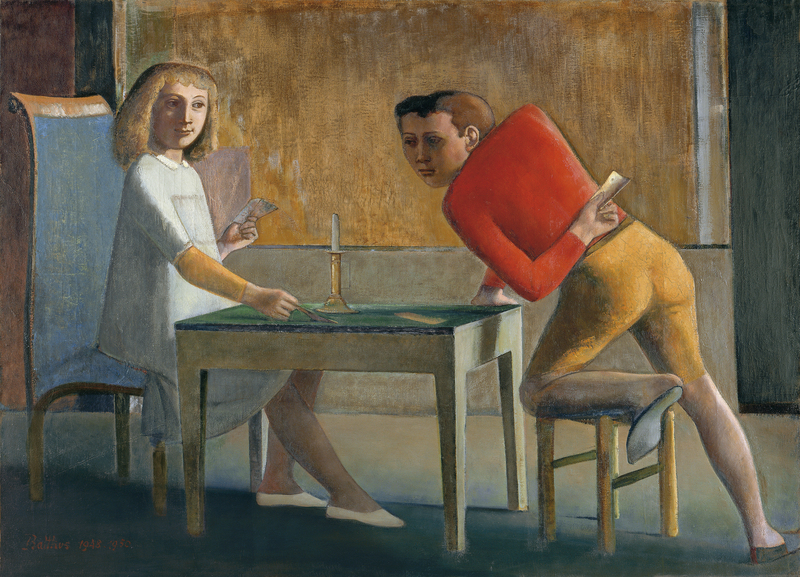 The Museo Thyssen-Bornemisza Card Game is a canvas in large format painted between 1948 and 1950, when Balthus resumed painting with renewed energy after the war. It shows two youngsters, a boy and a girl, playing cards at a table on which a candlestick stands, inside a simple, stark room. The austerity, monumentality, geometry and colouring of the painting clearly denote Balthus’s admiration for the work of Piero della Francesca. In the scene the light that enters from the right-hand side of the room coldly illuminates various objects and adds to the mystery of the picture. In Balthus’s paintings girls are queens and are therefore always portrayed as the winners. Boys normally play a more secondary role in the scene as impassive companions or rivals in games which they invariably lose. Although in the present painting the boy is prepared to cheat in order to win, the girl’s veiled smile shows that once again the norms governing Balthus’s world will prevail and she will be the winner in the end. The boy’s disjointed pose, which combines a frontal and profile view simultaneously, had already been used by Balthus in the illustrations for Wuthering Heights. The obscure childhood world of the main characters in Emily Brontë’s work, on which the artist made a large series of drawings in 1933 that were published in 1935 in Minotaure, the Surrealists’ magazine, is the origin of much of Balthus’s mature work. In addition, the theme of cheating and the game that is implicit in this scene, which Balthus infuses with a new symbolism, could be related to Caravaggesque tradition. Francisco Calvo Serraller has compared The Card Game with a work by Valentin de Boulogne, now in Dresden, which was in turn inspired by a lost work by Caravaggio, in which a rogue conceals the hand holding a stolen card behind his back. As John Russell states in the catalogue of the 1968 exhibition at the Tate Gallery in London, in which the present painting was shown, cards play a crucial role in Balthus’s oeuvre, “partly for their premonitory quality, partly for the formalized hostilities to which they give rise.” So much so that their influence is felt even when the cards are not visible.